1833 - First performance of Mendelssohn's Symphony No. 4. 1862 - First performance of Wagner's Flying Dutchman Overture. 1938 - Louis Armstrong recorded When the Saints Go Marching In. 1941 - Singer Ritchie Valens was born. 1960 - Fiddler Gid Tanner died. He was with the band The Skillet Lickers, which was popular in 1920's-1930's. 1972 - Birth of English violinist Tasmin Little. 1975 - Bob Wills, creator of the western swing style of music, died. 1997 - Bernard Brindel, US composer, died. Sir Arthur Sullivan was born May 13, 1842. He was named Seymour Arthur Sullivan, but later in life chose to simply go by the name Arthur. Sullivan's father, bandmaster of the Royal Military College, taught his son to play all of the wind instruments in the band by age 10. At 14 Sullivan won the Mendelssohn competition. He was offered scholarships to several academies and conservatories. In 1871, Fred Clay (a singer who knew both of the musicians) introduced Sullivan to William S. Gilbert. The result was a partnership that became one of the most respected and successful duos inthe history of musical theater. In 1874 D'Oyly Carte commissioned one of their first true successes, Trial by Jury, and he would be the impressario behind many of the pair's successful works. He remained a friend of Sullivan for the remainder of his days. Throughout their partnership they produced a huge body of work including such hits as: HMS Pinafore, The Pirates of Penzance, Iolanthe, Princess Ida, The Mikado, Ruddigore, Yeomen of the Guard, and The Gondoliers. Though the team was popular, successful, and most importantly full of talent, social differences between the two musicians eventually got the best of their partnership..
After the two parted, Sullivan decided to concentrate on more formal music so that he would not simply be known for comedies. He wrote numerous hymns (including Onward Christian Soldiers ) and instrumental pieces. He also wrote one grand opera. Sullivan was kinghted by Queen Victoria in 1883. 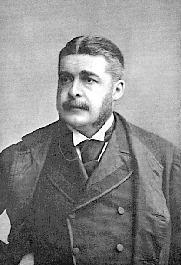 Sir Arthur Sullivan died in London on November 22, 1900. None of his formerly close friends or associates was at his bedside. Gilbert, who was on the Continent, read of Sullivan's death in the newspaper. D'Oyly Carte was sick in bed, too sick to be told of Sullivan's passing. Carte, from his bed, saw a funeral cortege pass his window. It was Sullivan's funeral, but Carte had no way of knowing it. "After it had gone by, some one went to D'Oyly Carte's room and found him out of bed and prostrate by the window. Asked what he was doing there he replied, 'I have just seen the last of my old friend, Sullivan.'" Four and a half months later, D'Oyly Carte followed his friend to the grave. W.S.Gilbert died on May 29, 1911.
and a Male Violinist image. We read of Arthur Sullivan's death in the article to the left, but W. S. Gilbert had a more heroic death. He died of heart failure in the middle of a lake. Can You Guess why he was there? W. S. Gilbert was giving swimming lessons to two girls, when one of the girls began having trouble. Gilbert swam out to save her, but evidently died of heart failure while in the lake. Gilbert & Sullivan (The World's Great Classical Music) Lyrics by W.S. Gilbert, music by Sullivan. Vocal score for voice and piano. With vocal score (which the violin can play), piano accompaniment, illustrations and introductory text. 336 pages. Published by Hal Leonard.